Screenshot of the Nation With NaMo website, which claims to be India’s biggest community of volunteers who have come together to support PM Narendra Modi. With India’s much awaited 2019 Lok Sabha general election just around the corner, political parties are gearing up their slogans in order to sway the people ahead of April 11-19 voting dates. This year, the campaign ads have leaned hard on social media, leading to a battle of the hashtags between the incumbent prime minister and those that want to unseat him. In 2014, Narendra Modi, the face of Bharatiya Janata Party pushed the slogan “Abki Baar Modi Sarkaar” (This time it will be Modi government). During the last election cycle, Rahul Gandhi, the current president of opposition party Indian National Congress, called Narendra Modi a ‘chowkidaar’ which means watchman or guard in Hindi. He then went on to call him “Chowkidaar chor hain” which means that the guard is, in fact, the thief. Putting a spin on this reference, the Bharatiya Janata Party came up with their 2019 campaign slogan — “Main Bhi Chowkidaar” (Even I am a guard). This slogan has created a wave of response across Twitter and discussion forums. Staunch supporters of BJP, also known as Bhakts, have given the hashtag their full support — even going so far as producing a line of merchandise. Phir Ek Baar, NaMo Chowkidar! India is showing its support for NaMo Again with Main Bhi Chowkidar T-shirts! Screenshot of the Twitter Home Page of the Indian Prime Minister Narendra Modi. BJP politicians, both politicians working in public office and non-elected officials, have changed their Twitter handles and added the title of “Chowkidaar” before their names. 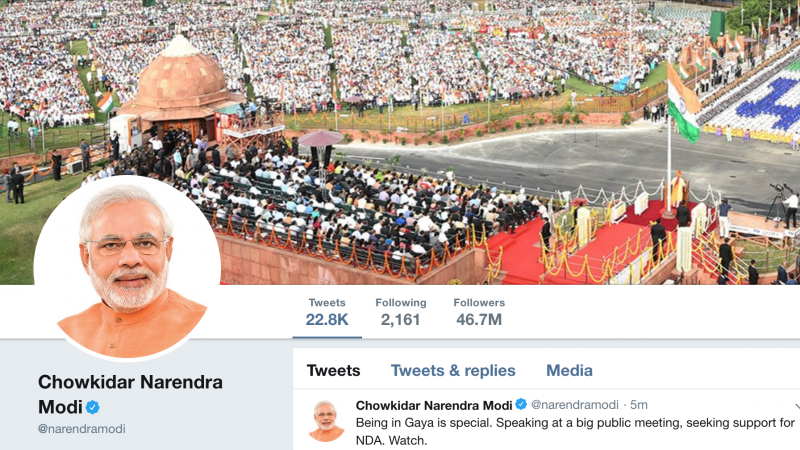 Prime Minister Narendra Modi’s personal Twitter account handle has also been changed to Chowkidaar Narendra Modi. A video of the campaign showing a mix of people with “Main Bhi Chowkidaar Hun” (I too am a guard) playing in the background has been released by the BJP. The video has also attracted a lot of attention and criticism. The Prime Minister shared the link of sale outlets for the merchandise of this particular campaign. Interestingly, the merchandise sticks to the saffron color and the slogan printed on it, adding to their image as the Saffron Party. Narendra Modi’s 2019 campaigns and rallies have been flooded by his Bhakts (supporters). A rally, which looked like the sort of presidential campaign you could find in the USA (with big screens, banners of slogans, audience sporting merchandise) seemed to be the highlight of Modi’s campaign. India came together and said in one voice- #MainBhiChowkidar. A big thank you to all those who took part in the programmes across India! In Mumbai, a car rally was also organized as part of the political campaign by BJP. The rally participants were seen donning saffron-coloured T-shirts with the slogan printed on it. PM Narendra Modi organised video conferences for the programs of his speeches. There are lakhs of Chowkidars in every part of India. 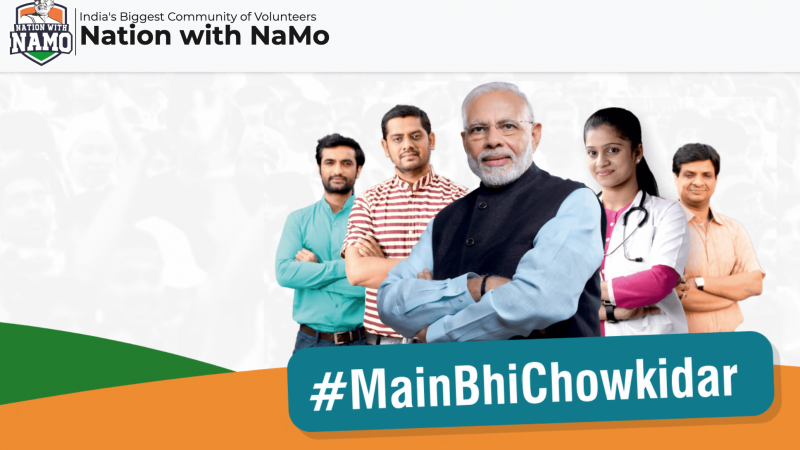 Here is where you can join a #MainBhiChowkidar programme nearest to your place of stay. Criticism of the BJP hashtag campaign has also been strong and the Indian National Congress Party has kickstarted with their campaign slogan –“Main Bhi Berozgar” (I too am jobless) as a mockery to the slogan of the BJP. In support, the Youth Wing of the Congress introduced the hashtag of “#MainBhiBerozgar”. Some of the INC party officials followed suit and changed their Twitter handles. As a spin on the entire BJP campaign, the INC Party has changed the slogans but maintained one– “Chowkidar Chor Hain” (the guard is the thief). At a recent Indian Premier League match (Cricket) in Rajasthan, a part of the crowd started chanting this slogan as per a video that went viral. During the match between Rajasthan and Punjab states, spectators were heard belting out “Chowkidaar Chor Hain”. This might not come as a surprise for many, as the current Chief Minister of the Rajasthan state is of the Congress Party. बीच मैच, मच गया शोर…. The guard is the thief…! On April Fool’s Day, INC came up with two new hashtags- #MadiMatBanao and #ModiDiwas- translating to ‘Don’t make us Modi’ and ‘Modi Day’. कहा गई 2 करोड़ नोकरियाँ? दुगनी आय? हर खाते में 15 लाख? Where are the 20 million jobs? Double income? And where are the 1.5 million (Indian Rupees) in every account? Another strategy utilized by both the parties is of giving candidature to celebrities from the film and television industry. This is one of the oldest strategies in Indian politics and this time too — they have banked on it. Political parties candidates have started to fill nominations across the country from the respective Lok Sabha constituencies. Meanwhile, others have been critical about this tactic with comedians directly dissecting the BJP slogan and articles asking whether the entire political party is worthy enough to be called as the guards of the country. Comedians have been blatant critical of the current governing party, and have continued with the same enthusiasm since the campaigns of 2019 have gotten into full swing. All of this drama would be put to test as the world’s largest democracy goes into election from the 11th April to 19th April 2019.